We’d love your help. 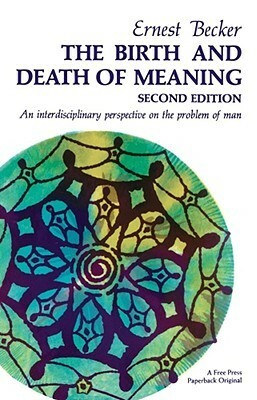 Let us know what’s wrong with this preview of The Birth and Death of Meaning by Ernest Becker. To ask other readers questions about The Birth and Death of Meaning, please sign up. You can read texts of great literature, the novelists, the existentialists etc; to understand what is the human condition. But in my opinion, no amount of reading fictional literature can compare to what psychology and anthropology can offer on this topic, probably because they have a more systematic or 'scientific' method of inquiry. My thoughts upon reading this book: it's a genuinely penetrating book, but don't read it; not every brilliant book has to be read. Go on living your life, performin You can read texts of great literature, the novelists, the existentialists etc; to understand what is the human condition. But in my opinion, no amount of reading fictional literature can compare to what psychology and anthropology can offer on this topic, probably because they have a more systematic or 'scientific' method of inquiry. Quite simply one of the most important books that I have ever read - the work of an absolute genius of the very first order. To read it with an open mind and with a willingness to attend is to usher in the possibility of super-pleasure and super-thought. Buy, read. Digest. Read again. Percolate. Read again. Read Denial of Death first. If you want more, try this. A paradigm-shifting, Matrix-unplugging piece of work. This book, along with Becker's Denial of Death, are excellent analyses of the human condition and why we do literally anything. His main argument is how everything we know that is human behavior and culture is just a mirage and a way to protect our fragile selves from an unacceptable paradox: that we're the only creatures we know of with consciousness and are aware of our own mortality, yet we know that our lives are completely meaningless in A paradigm-shifting, Matrix-unplugging piece of work. This book, along with Becker's Denial of Death, are excellent analyses of the human condition and why we do literally anything. His main argument is how everything we know that is human behavior and culture is just a mirage and a way to protect our fragile selves from an unacceptable paradox: that we're the only creatures we know of with consciousness and are aware of our own mortality, yet we know that our lives are completely meaningless in the grand scheme of the cosmos. I'm not smart enough to know if all his arguments and analysis is correct, but it is so exactingly well put into words the anxiety-ridden experience that is being human that I'm left agreeing with much of what he says. This is a great introduction to Becker and to psychoanalytic thought in general. I found this much more approachable than “The Denial of Death” but it wasn’t quite as rich. I would definitely start here. Becker outlines his view of what makes humans tick and presents his conclusions clearly and convincingly. He writes in such a way as when you read him you feel like he’s saying things that you somehow always knew but couldn’t put to words. My own personal thought has been greatly shaped y Becker This is a great introduction to Becker and to psychoanalytic thought in general. I found this much more approachable than “The Denial of Death” but it wasn’t quite as rich. I would definitely start here. An insightful little book that may contribute interest or internal discussion points to your awareness and understanding of culture, society and yourself. Very recently hopped aboard the Becker train and have been enjoying each book for what it contains, regardless of its ultimately flawed outcomes. Very much recommended, just don't linger too long on its age. Wow-read this for my social psychology course and loved it! When I first saw it's published date I thought it was rather dated and wondered how relevant it could be....boy was I in for a surprise and this just proves the worth of this book. Totally recommend to anyone who is trying to understand human behaviour and society!!! One of the best books I have read in a long time. I wish I had read this book before The Denial Of Death since it would have better prepared me. Truly an amazing piece of work. Unimaginable what Becker would have accomplished had he had 20 more years on this planet. Highly recommended, no, a MUST READ. Probably one of the most poignant synthesis of human understanding I have read. It gradually reveals the root of humanity's irrational machinations, it's compulsive agitations. In short it shows how precisely human consciousness is existential-insecurity; and how neurosis is, for individuals and for entire societies, every contortion of perception, every delusion and every scheme against reality as it is -- simply everything that tries to cover up the despair, dread and anxiety that conscious aw Probably one of the most poignant synthesis of human understanding I have read. It gradually reveals the root of humanity's irrational machinations, it's compulsive agitations. In short it shows how precisely human consciousness is existential-insecurity; and how neurosis is, for individuals and for entire societies, every contortion of perception, every delusion and every scheme against reality as it is -- simply everything that tries to cover up the despair, dread and anxiety that conscious awareness itself evokes. This book rewards reflection and rereading. I am deeply grateful to Becker for his deep human insights and introducing me to a whole range of authors that would have otherwise gone unknown to me. This book was required reading for one of the film theory classes I took in college. Unlike the rest of my college texts, I still have this book. Becker's concepts were quickly assimilated into my post-college belief system; probably leading me to all that Ayn Rand and Kurt Vonnegut reading of my post-college years. In fact, I think it's time for me to re-read this book so I can perhaps have more sympathy for those who are like the boxer in Becker's book: "I could have been a champion!" 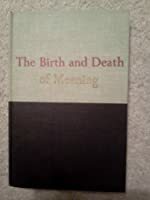 Becker's "The Birth and Death of Meaning" was one of the most important books in a life of reading and one of this reader's most exciting learning experiences, as taught by Arthur LeGacy in his Syracuse University class, "Psychoanalysis and History." Great overview of the intertwined concepts in psychology, sociology, and anthropology that elucidates the role of meaning. I love how Becker gives the excellent examples that further illustrates a vague explanation and theory. An apologist for Freud. An attempt to synthesize anthropology and psychoanalysis in a "science of man". Pretentious pseudo. Couldn't finish it. This book is a wonderful book of the human spirit! Possibly the most important and vindicating books I've ever read. This book took forever to read. Excellent writing, interesting subject. Becker was born in Springfield, Massachusetts to Jewish immigrant parents. After completing military service, in which he served in the infantry and helped to liberate a Nazi concentration camp, he attended Syracuse University in New York. Upon graduation he joined the US Embassy in Paris as an admi Dr. Ernest Becker was a cultural anthropologist and interdisciplinary scientific thinker and writer.